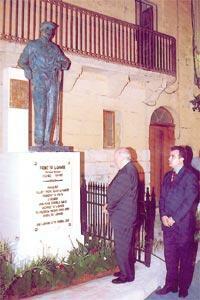 President De Marco inaugurating the monument to Frenc ta` l-Gharb. Looking on is Gharb mayor David Apap. On August 29, President Guido de Marco unveiled a monument to Francesco Mercieca, better known as Frenc ta' l-Gharb. The ceremony was held at the beginning of the street named after the saintly herbalist in Gharb. It included poetry readings by Jonathan Mintoff, Noel Fabri and Lorna Cassar, musical pieces by the Mosta Scout Group, a talk on Frenc's life by historian Rev. Dr Joseph Bezzina, a testimonial to a cure through the intercession of Frenc ta' l-Gharb by Clayton Pace, a motorcyclist who was seriously injured a year ago in an accident in San Lawrenz Road, and Raymond Cauchi, whose favourite horse was near death but recovered well enough to win first prize in the first race in which it took part. The trophy won in that race was presented to Mgr Benedict Camilleri, a nephew of Frenc, to be placed in the museum dedicated to Frenc ta' l-Gharb. The life-size monument, by the Gozitan sculptor Alfred Camilleri Cauchi, was cast in bronze at the Bonvicini brothers' foundry in Verona, Italy. The monument was blessed by the local archpriest, Mgr Carmelo Gauci. Gharb mayor David Apap, Fr Bezzina and President de Marco made speeches for the occasion. Frenc was born to a farming family in the small village of Gharb on December 3, 1892, and spent his first years like most of his fellow villagers - between family, fields, farmhoue and church. Fr Bezzina described him as a great devotee of Our Lady of Ta' Pinu, in whom he had great faith. Indeed, thanks to his devotion to Our Lady, Frenc became an intensely spiritual man. Frenc eventually discovered that he was chosen for a higher calling. One day in 1937, shortly after his 44th birthday, Frenc was asked to visit a certain Guzepp Cauchi, a fellow villager, who had injured his ankle in a fall and was unable to walk. Frenc suddenly felt he could help this man and managed to heal him by massaging the ankle with holy oil taken from in front of the image of Our Lady. Frenc continued to make use of herbs and massages. Indeed, Fr Bezzina continued, he was an excellent masseur without ever receiving training. In his hands, these herbs, oils and wine acquired a certain potency, which managed to heal the sick and relieve the suffering. However, in whatever he did, Frenc resorted to prayer, especially to Our Lady. Frenc died at home, where he had spent his entire life, on May 19, 1967. The house was turned into a museum, which was officially opened by the late President Agatha Barbara (who had a residence in Gharb) on May 25, 1986. Frenc was buried at Ta' Pinu Sanctuary. Mgr Benedict Camilleri, who is also a former rector of Ta' Pinu Sanctuary, thanked all those who attended. Among those present were Labour MPs Dr Anton Refalo and Dr Justyne Caruana.